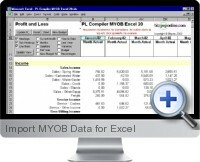 Import MYOB Data for Excel will import and format monthly Profit and Loss data from MYOB (Mind Your Own Business - accounting software). Using this information it will compile a flexible Excel Profit and Loss report allowing the selection of the amount of detail displayed and use of the data for performance review and budget formulation. An improved understanding of business operations. Significant time saving in performance reviews and budget creation.